Once per turn: You can target 1 Level 4 or lower monster you control; increase its Level by its original Level until the end of this turn. If your monster(s) in the Extra Monster Zone would be destroyed by battle or card effect, you can banish this card from your GY instead. You can only use this effect of "Cyberse Synchron" once per turn. 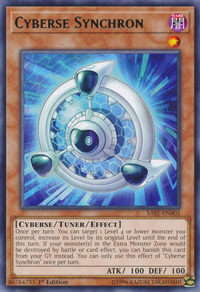 This card is the first Cyberse Tuner monster. This card is 1 of 5 Synchron monsters whose Type is not Machine; the other 4 being Junk Synchron (Warrior), Synchron Keeper (Zombie), Performapal Odd-Eyes Synchron (Spellcaster), and Rokket Synchron (Dragon). It is also the only Cyberse Synchron monster.